Jeff Hendrickson, Principal at Lanigan Elementary School recently honored students for demonstrating the Fulton City School District’s virtue of the month for December which is empathy. Empathy is the ability to recognize and share someone else’s feelings and emotions. 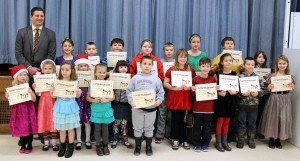 Award winners from Lanigan Elementary School for virtue of the month for December. Finley Nye, Kiley Pudney, Orianna Romanowicz, Addison Smith, Alyssa Bort, Josephine Regensburger, Ethan Clark, Katelyn Gerth, Vincent Salerno, Makenzie Gardner, Justin Noeller, and Isabella Deane. In back, left to right: Christina Tallents, Sean-Evan Rogers, Mark Smith, Kyra Baker, Brock Lindsley, Julia Brown, Nicholas Furbeck, and Dana Galoni. Missing from the photo was Chloe Bergman.